The SPE Mixit 25™ - a robust and portable mixing solution for high output, single handed operation. 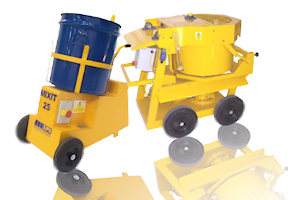 The SPE Mixit 25™ pan Mixer was developed to mix promptly and effectively a wide range of materials. The mixer is driven by a sealed motor and gearbox providing many years of trouble free operation. An optional perforated paddle is available to increase agitation by forcing material through its perforations. The machine is both robust and portable, offering the user high output and single handed operation. The Mixit 25 is an electrically driven machine available in both 110v and 220v single phase and also a 3 phase 415v model.